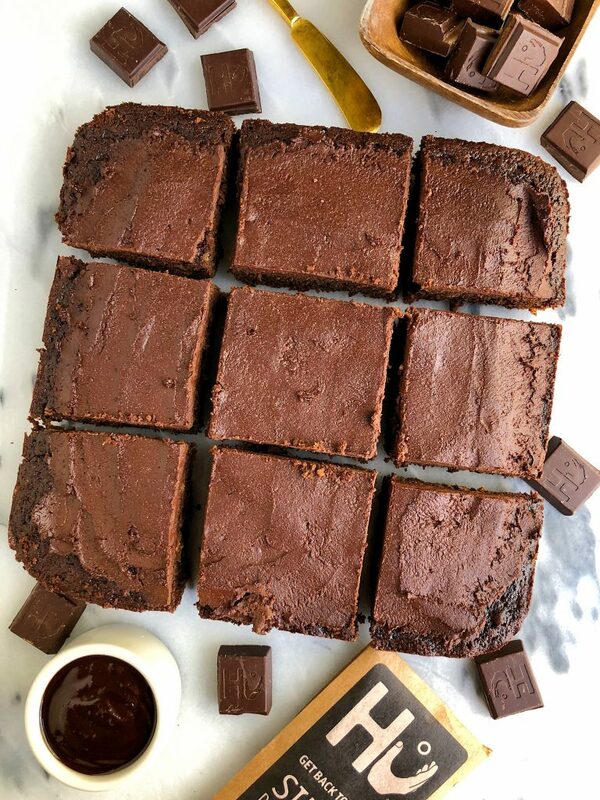 The Best Paleo Chocolate Sheet Cake made with coconut flour, coconut milk and all nut-free ingredients paired with a homemade chocolate ganache that is refined sugar-free! I am actually giddy writing this blog post for you today. I love all the recipes I share here with you but this one has me feeling extra gooooood today! I am sharing The Best Paleo Chocolate Sheet Cake that is nut-free, grain-free, dairy-free and just deliciously simple and topped with a homemade chocolate ganache. But the recipe itself isn’t the only reason why I am giddy. It is more about who I have partnered with on today’s blog post. Chances are you know I am obsessed with all things Hu Kitchen. I eat there at least 3-4x per week and am constantly running in and out of their restaurant when I am in the city. It is also my “office” in the city, where I sit with my computer and do work in between various meetings and things in the city. Incase you are new around here and wondering what the beep Hu Kitchen is, let me fill you in. 4 years ago, Jord and I were living in the heart of Chelsea, just a few short blocks away from Hu Kitchen. I would go here all the time for sweet treats, eats and to meet friends for lunch or dinner. I love that Hu is a paleo-friendly restaurant (I am not paleo just love grain-free foods so much!) and that they use no canola oils and all organic ingredients. It isn’t common to see a restaurant have that much passion for the quality of ingredients they serve. I trust Hu’s food just like I do the food from my own kitchen. Hu serves anything from these epic Jordy Cakes for breakfast (named after the founder, Jordan), which are banana pancakes to wild salmon cakes, grain-free focaccia bread and an impressive line up of desserts. You can find Jord (husband Jordan) eating their walnut brownies and me feasting on their almond butter cookie dough balls and their paleo chocolate chip cookies. For my birthday last year we got 5 different desserts and put candles in them all. That is how obsessed I am! Hu also sells a chocolate line that is refined sugar free. All organic and sweetened with coconut sugar. Let’s just say, I haven’t eaten a Hu Kitchen chocolate bar I didn’t like. The cashew butter and pure vanilla bean one is my favorite but I love baking with and eating all of them. Keep them in the freezer too as they are SO good frozen, oh my goooosh. 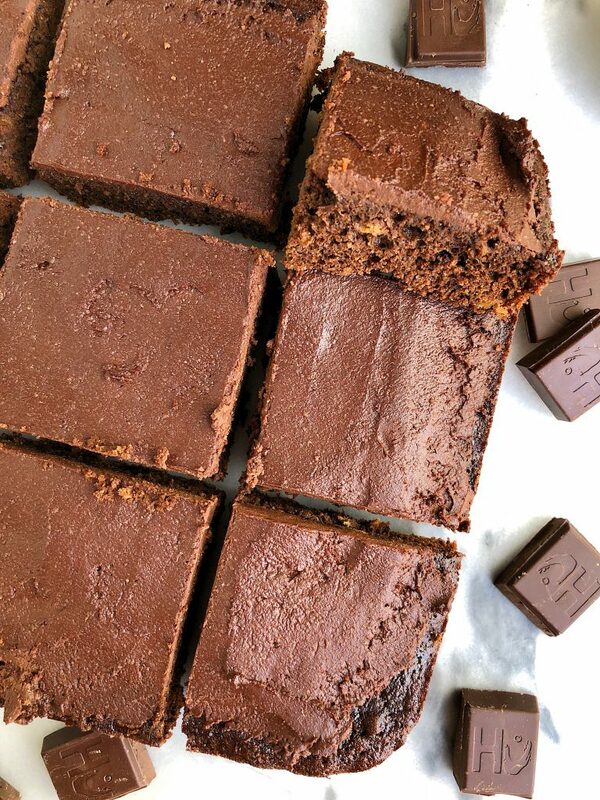 Today we are making this homemade chocolate sheet cake that is paleo, made with 6 key ingredients then topped with a chocolate ganache using Hu Kitchen chocolate, grass-fed butter or coconut oil and a few other goods. This cake will put devil’s food cake mix to the test. 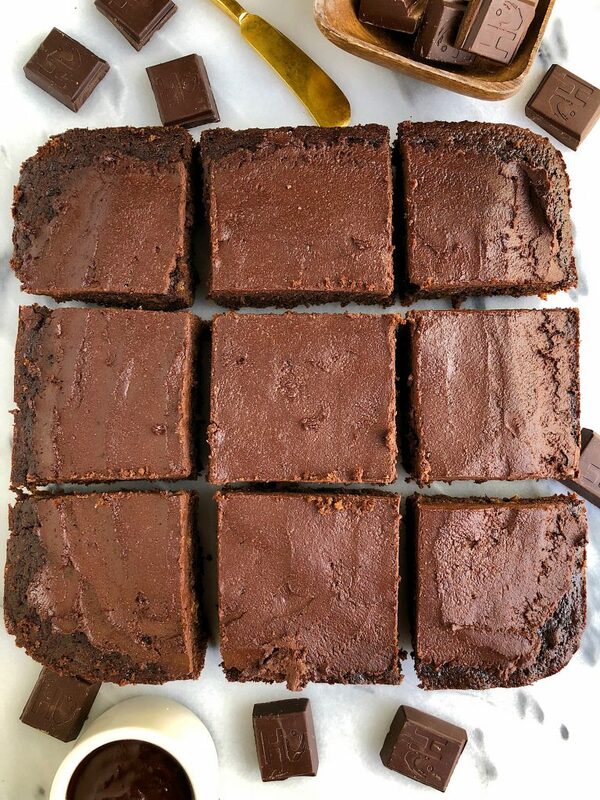 it is super moist, lightly sweetened and too easy to make! Don’t forget to stop by Hu Kitchen when you’re in town and share on social when you make this cake. Stir every 5 minutes in fridge until the ganache thickens then spread over the cake, slice into 6 slices and enjoy! Thank you Hu Kitchen for sponsoring this post! It means so much to me to work with brands I love and believe in! Can you sub flax for eggs? I poked holes in the cake so the ganache could seep in! So good!! This recipe is SO GOOD. I didn’t have access to the Hu Chocolate Bar, so I substituted one bar for a heaping 1/4 cup of Enjoy Life semi-sweet chocolate chunks and it turned out great!!! Thanks so much, Rachel!!! This looks phenomenal! 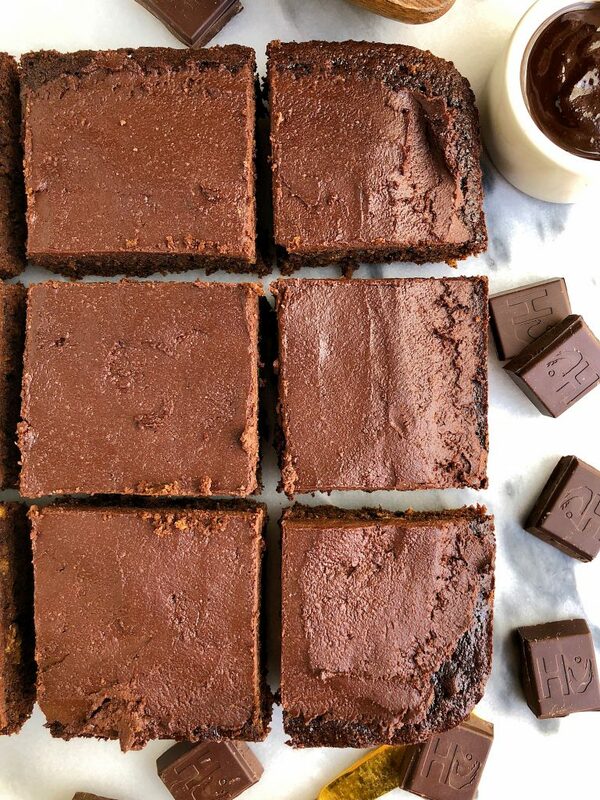 Have you ever doubled the recipe to utilize a 13×9 baking dish? And are there any modifications with baking time when using a glass dish vs metal baking pan? One last question, I live at high altitude (~5,600 feet), any modifications I might need to try (more coconut milk, oil or egg)?